When you think of Provence and the French countryside, you're sure to envision lavender fields and bright sunshine. While there are many elements that contribute to the French Country style of decorating, the resulting look is always rustic, old-world, and welcoming. This style of decor fits well in both country houses and elegant, old chateaux. It has a warm and casual feel that will fit beautifully into your home as well. By incorporating some or all of these elements, you're bound to have a wonderful French Country interior. C'est bon! Bright black and dull grays punctuate those bright colors and define accessory pieces. Rusted metal furniture, lighting fixtures, and furniture give warm color and wonderful lines as well. Typical of French Country interiors are pieces with contrasting texture and color. Pale plaster walls and ceilings are punctuated with dark rough wood beams, for instance. You might also try colorful Provencal printed fabrics set off against light-toned natural seating. 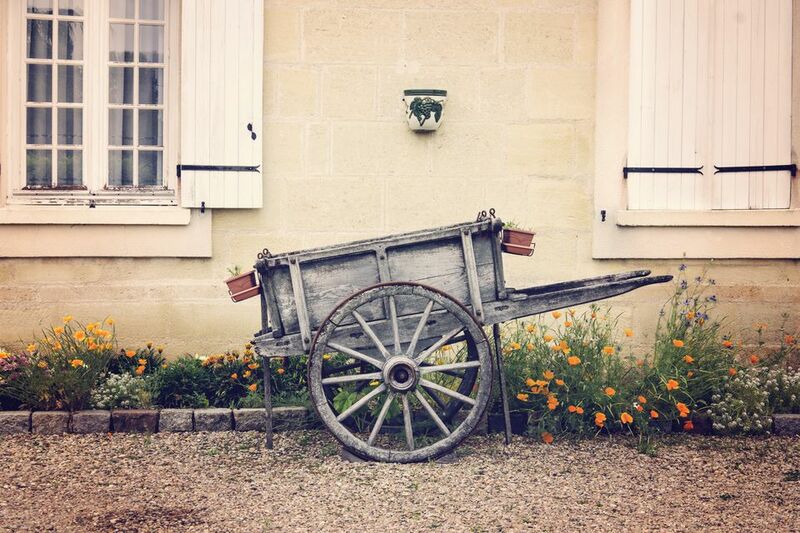 Natural materials are an important element in pieces used in French Country style decorating. Rough stained or painted plaster walls, hefty beamed ceilings and walls, delicately carved wood details, and rush-woven chair seats give texture and simplicity to the look. Natural stone floors are also often covered with wool or cotton rugs. No real French Country home is complete without a stone fireplace. A heavy beam at the top serves as a mantle and tiles—either stone or ceramic—form the border. The hearth is clay or brick, and herbs, copper pots, and iron accessory pieces hang on the side walls. The materials used in French Country often appear in eye-catching architectural features. Things like stone walls and floors, raw wood distressed ceiling beams and timbers, and irregular plaster walls form the frame of a home decorated in this style. New or reproduction rustic furniture has the ambiance of curved panels, hand-carved decorations, and raw wood. And no room decorated in the French Country style would be complete without an armoire to store pots and pans, clothing, bed or bath linens, or tableware. A large dining table—rectangular or round—must have a dull waxed or low-sheen finish. Curved and carved details often grace the dining and occasional chairs which accent it. The chairs are either ladderback style or have vertical slats, often with rush seating. Rustic flooring is of stone, clay, or brick. Old wooden boards work well, too. The focus here is on old and charming. Deeply cut window sills hold tall, narrow windows. Shutters close to keep the hot sun out in the summer. Windows and doorways are often encircled with wildly growing vines. The beautiful colors of the French countryside decorate fabrics used in French Country interiors. The traditional fabrics combine well with basic plaids, checks, and stripes in modern homes. Provencal prints combine shades of primary colors with greens, lavenders, and bright orange. Traditional French country products and motifs include roosters, olives, sunflowers, grapes, lavender, and beetles. The designs are often arranged at regular intervals, bordered by a wide panel of the motifs on a different scale. This is typical for textile products such as tablecloths and curtain panels. Toile is a traditional design for French Country fabrics. It's often found in a white, cream, or yellow ground with large motifs in a single contrasting color, such as black, blue, red, or green. Toile themes include farm animals, monkeys, Chinese patterns, bucolic country scenes, or courting scenes of the 18th century. Most toile patterns are printed on linen or cotton. When it comes to the decor items in a French Country room, you'll find plenty of inspiration. Generous woven or wire baskets, colorful ceramics and tiles, carved wood pieces, Chinoiserie pottery, and natural grasses are commonly used in this style. Old, dark, or colorful paintings adorn the walls as well. Lush natural flowers are everywhere! Baskets, an old pitcher or copper pot, or clear glass vases hold flowers inside and out. The aim is to bring the wonderful colors and textures of nature into your home. Window boxes outside shout with the colors of whatever will grow. Geraniums and lavender are especially popular. Both colorful and muted pottery adorns a French Country table. (No fine china here!) The same themes of roosters, olives, and vivid flowers are found on the tableware. Don't forget iron candle holders, wire baskets, heavy pottery water pitchers, and colorful tablecloths.